With our state of the art manufacturing facilities, we are able to create high quality display cases and shelves to serve both small and large-scale retailers. With nearly 50 years of experience manufacturing fixtures for grocery and retail use, Pan-Oston is a leader in providing bakery display and pastry cases for a variety of clients such as convenience stores, mass merchants and grocery stores. Here at Pan-Oston, we offer a wide array of high-quality display products to suit your store’s needs. These include bakery wall shelving, lighted display cabinets, and different kinds of display tables to showcase pastries, bread, and other baked goods. Our bakery racks also come in a variety of wood stain colors including Black, Natural Almond, Kensington Maple, and Wild Cherry. With our state of the art manufacturing facilities, we are able to create high quality display cases and shelves to serve both small and large-scale retailers. Depending on your store’s needs, trust that you can find the bakery cases and other fixtures you want right here at Pan-Oston. Our bakery display cases are specially designed to sell more products at great values. Featuring built-in allowances for wax paper, trash, and storage, and well-designed wood exteriors with tempered glass, our bakery cases are the perfect way to showcase best sellers and focus attention to new products. Moreover, attractive display racks and the way goods are presented have a positive effect on buyers’ preference for a store. That’s why we strive to create the most eye-catching and functional displays that permit baked goods to stay looking fresh, and allow customers to easily find the items they need. Convenience stores and small groceries can benefit from the ease of use our bakery displays offer. We can accept orders for custom-made cases that are designed to perfectly fit your business. We can fabricate wood displays with hardwood, plywood, and other types of common materials based on your specifications. We will also work with you on your delivery preferences so that you can receive your orders on time. 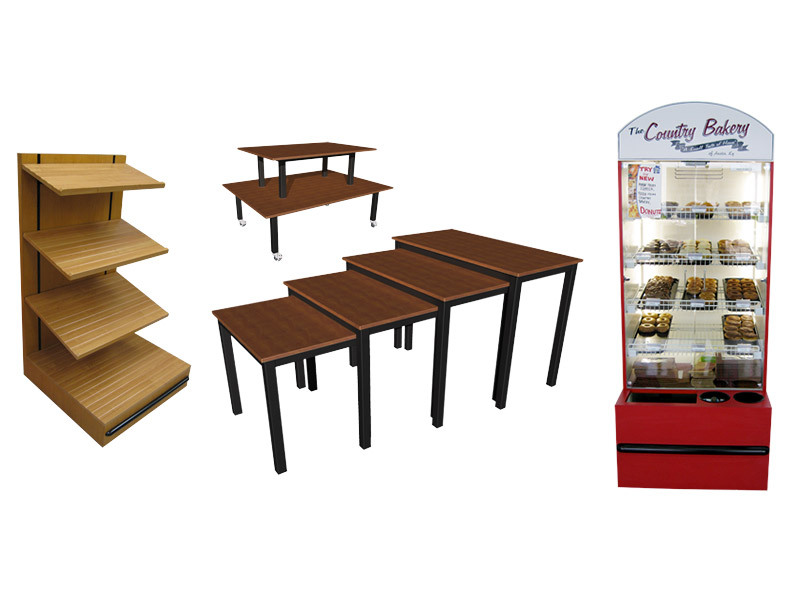 As a true leader in providing for retail businesses of all sizes, we also cater to needs beyond simple furnishing. Service parts and accessories for the pastry displays and bakery cases we produce are also available, as well as field support offered every day of the week.